Fanvil’s new high-end enterprise IP phone is now on the market. The X210 has the ability to manage medium to high call volumes making it suitable for business managers and busy office professionals. The flexible advanced features this phone has to offer allows for easy communication. The 10 DSS keys on its 4.3″ main colour display and up to 96 DSS keys on 2 x 3.5″ side colour displays increases enterprise users’ productivity at a cost-effective price. The phone has a variety of different connections including Wi-Fi connectivity via a Wi-Fi dongle, EHS headset, integrated Bluetooth and USB ports for charging other devices. It has high-interoperability therefore is compatible with major platforms including 3CX, Broadsoft, Elastix, Asterisk, Xorcom. The X210 is equipped with the newly-added Opus delivering great quality sound to end users. It also has an adjustable stand therefore the Fanvil X210 phone can be tailored to each user. Other advanced features this phone has to offer is the ability to video call in HD (supports Codec H.264) with IP camera/ SIP door phone integration. The X210 also has built-in Bluetooth for connecting a Bluetooth headset and dual gigabit ports. 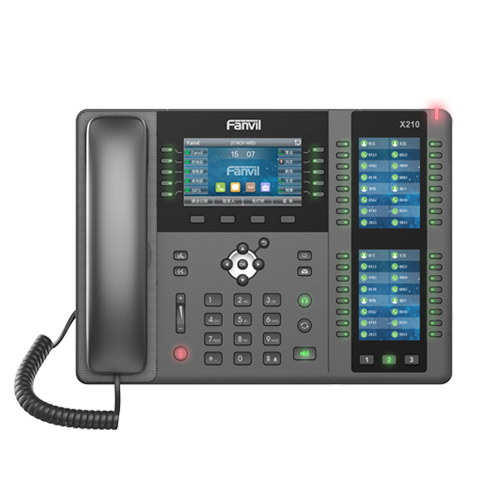 This phone works as a mini PBX therefore, with other Fanvil VoIP phones and SIP door phones, the X210 enables you to build a small community and security solution.